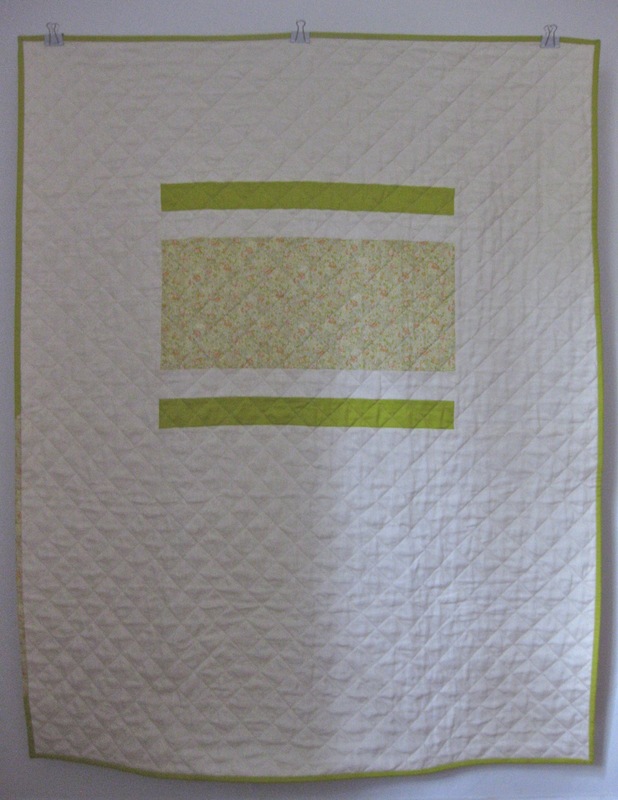 I finally used some yellow (almost) in a quilt and I love it. When I started working on the design I was planning to use the yellow print (from the Olympus Soleil collection) along with a citron yellow. Then I noticed the print’s selvage colors (the little colored circles at the edge of the fabric that show what inks are used in the print) and I was surprised that there wasn’t a true yellow. Even though the overall effect is yellow–the actual colors are chartreuse, lavender, peach, mint, and ecru. I had ordered some Wasabi Kona cotton (one of the new colors) for another project and it was a perfect match for with the yellow-green in the print. Wasabi is one of those colors that really changes depending on the light–sometimes it looks green and sometimes yellow. The linen is handkerchief weight in natural from fabrics-store.com. It has a really beautiful drapy-ness. 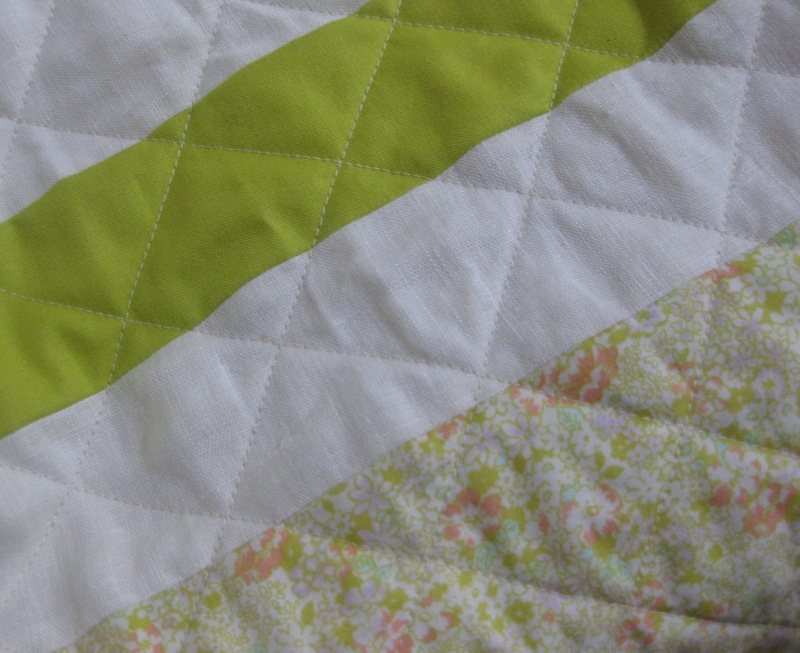 I used gray gingham for the back–I love how the yellow-green contrasts with the gray. This quilt is added to my Etsy shop. 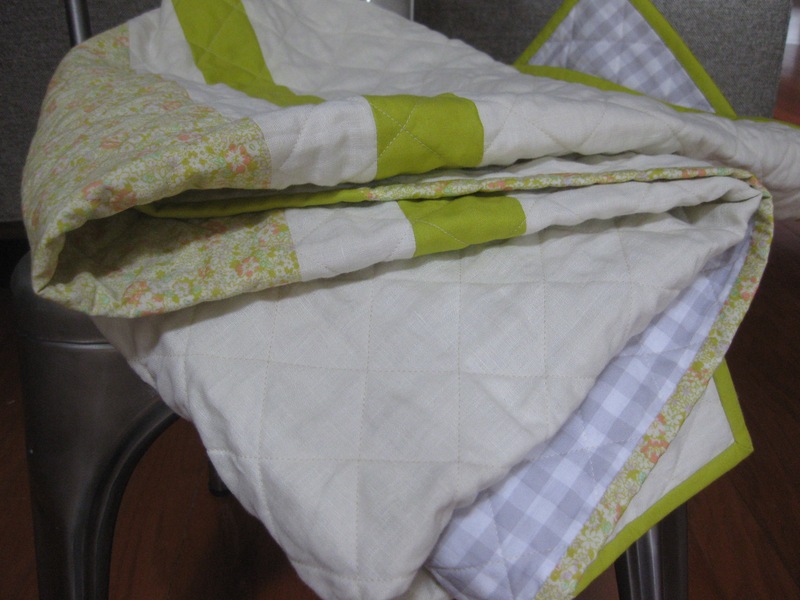 This entry was posted in kids stuff, quilts, suppliers and tagged geometric quilt, handkerchief linen, linen quilt, minimal quilt, modern baby quilt, yellow and gray quilt on February 1, 2014 by brigitdermott. Simple yet very elegant and fresh! I love this quilt! Beautiful!